Use with WAX or INK. Each Wax Seal Stamp comes with a Black Velvet Bag and Instructions. 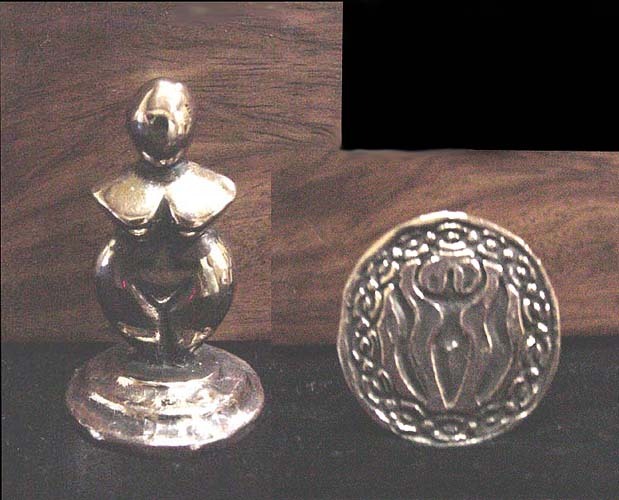 All Seals are made from Pewter unless otherwise stated. Aine, Goddess of love and fertility, later known as an Irish Fairy Queen. Also known as Moon Goddess; patroness of crops and cattle. Connected with the Summer Solstice. Symbolised by the Meadowsweet herb. The Celts are known to make offerings to this Goddess of Love during the Summer Solstice when they burn straw and flowers in her honour and ask in return that she may keep evil and ill health from their doors. A well known goddess of Ireland is Aine, who is exceedingly friendly to men and worshipped for her powers of bestowing fertility, abundance, prosperity and love. She is said to have mated with several humans, having created a magical fairy/human race. An Irish Earl once stole Aine's cloak while she swam in a river, and would not return it to her until she agreed to marry him. Irish legends depict her son as an archetype of Lancelot in the later Arthurian legends, while Aine herself is the Lady of the Lake. Her son was known as the Magician, and Aine told the Earl never to be surprised at anything he could do. The Earl was surprised when his son performed a wonderful superhuman deed, and this set Aine free to return to the fairies. Aine is in several tales strongly associated with the Yew tree which shows her as a Goddess of Life and Death. In all her aspects it is clearly shown that Aine was no deity to offend, for in spite of all her beneficent attributes, if crossed she could have coined the phrase "Hell hath no fury like a woman scorned". 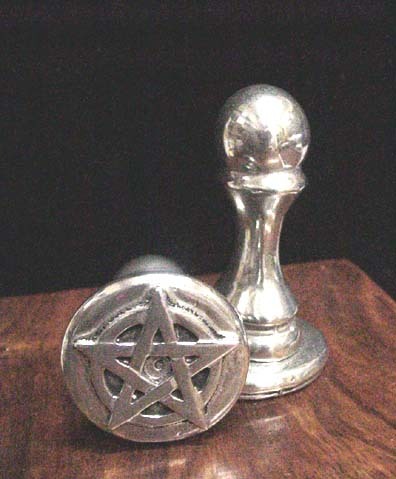 This is a 1" diameter, Aine Pentacle Wax Seal Stamp. It is topped with the beautiful fairy goddess 'Aine' standing 2 1/4" tall. An heirloom for years to come! Makes a stunning, crisp, detailed wax seal. Also can be used equally well with ink and seal wax. When using with ink place light cloth or felt under paper for the best impression. approx 2 1/4" tall. Remember before sealing wax, always lightly oil (olive or cooking oil) the stamp. Comes, as do all our stamps, in velvet bag with instructions for 'How to wax seal with wax and ink'. Older than the Pyramids, "Nathor" is an ancient Egyptian name for the Nile River Bird Goddess of the Moist Heavens. 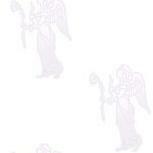 Her face is bird like in shape and her hook shaped hands symbolise regeneration. She awakens Primal Female power as she "Draws down the Moon" with her sweeping arms. Egypt from 4,000 BCE, the elegant flowing shape of this figure has become a symbol for Women's Spirituality. 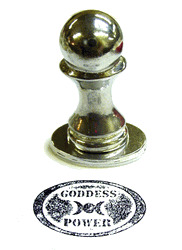 This is a 23mm diameter round, NILE GODDESS Wax Ink Seal Stamp. Makes a crisp detailed wax seal. Features the Nile Goddess figure in centre surrounded by a celtic knotwork border. Hand polished, this is an heirloom for years to come and part of our new limited wax seal collection! 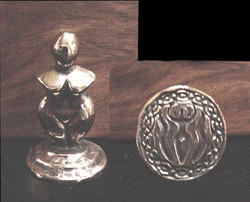 It is topped with a stunning Goddess which also forms the handle of this beautiful seal. Not only a Seal but an appealing statue for your desk or altar!! This stamp also works with ink. When stamping ink, always place a thin cloth beneath the paper for the best impression. An heirloom for years to come! approx 1 1/2" tall. Also always remember before sealing wax always lightly oil (olive or cooking oil) or even better water, wet the stamp to prevent sticking. 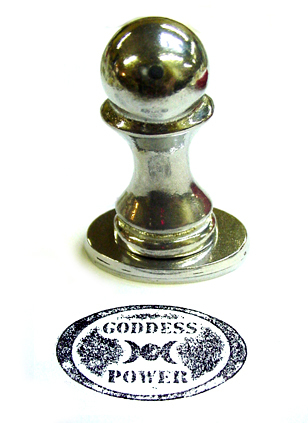 This is a 36mm x 21mm oval, GODDESS POWER Triple Moon Wiccan Pagan Wax Ink Seal Stamp. Makes a crisp, recessed, detailed wax seal. This stamp even works better with ink. When stamping ink, always place a thin cloth beneath the paper for the best impression. An heirloom for years to come! approx 2" tall. Also always remember before sealing wax always lightly oil (olive or cooking oil) or even better water, wet the stamp to prevent sticking. This is a 30mm x 17mm oval, BLESSED BE Wiccan Wax Ink Seal Stamp. 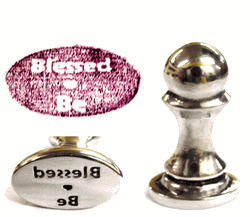 This stamp leaves a raised "Blessed Be" when using wax. This stamp also works with ink. When stamping ink, always place a thin cloth beneath the paper for the best impression. An heirloom for years to come! and not handle in this picture. One of the most important texts of occidental magic was Eliphas Levi's "The Magic Ritual". It is the source of this pentacle, believed by many to be one of the most powerful pentacle designs ever conceived - sometimes known as the Tetragrammaton. "Tetragrammaton" is a Greek word that represents the letters Y. h. V. h. that represent the sacred name of God in Hebrew, which does not use vowels in written language. This is a 1" diameter, Tetragrammaton Wax Seal Stamp. Makes a stunning, detailed wax seal. Also uses little wax and leaves very fine wording and symbol detail. Can be used with an ink pad too. When using with ink place light cloth or felt under paper for the best impression. Handle is solid pewter and stands approx 3" tall. Remember before sealing wax, always lightly oil (olive or cooking oil) the stamp. Theban script was created by Honorius in the 12th century as a way to encode other writing (likely Latin at the time). This alphabet is also sometimes called the "Runes of Honorius" or the "Witch's Alphabet." The Theban Script was a popular alphabet used by Gardnerian Witches. It is commonly used for talismans & amulets. This is a round, THEBAN PENTACLE Wax Ink Seal Stamp. 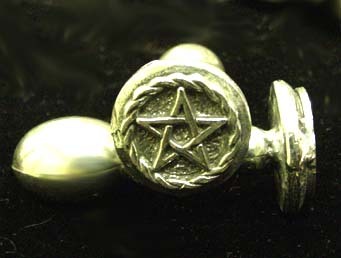 The wax stamp itself is a Pentacle in Circle symbol. Makes a crisp detailed wax seal. Around the base in Theban letters is the word L I G H T.
It is topped with a stunning Quartz Crystal Staff which also forms the handle of this beautiful seal. Not only a Seal but an appealing Crystal piece for your desk or altar!! Handle is solid Quartz Crystal with Pewter base and stands approx 2" tall. Also always remember before sealing wax always lightly oil (olive or cooking oil) or even better water, wet the stamp to prevent sticking. 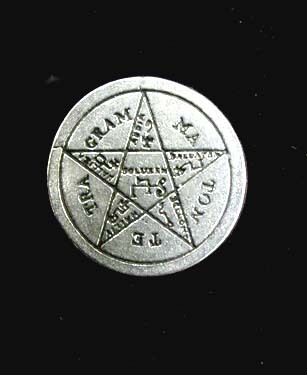 This is a 1 1/8" diameter, Extended Points Pentacle Wax Seal Stamp. Makes a crisp, detailed wax seal. Also can be used equally well with ink and seal wax. When using with ink place light cloth or felt under paper for the best impression. Handle is solid pewter and stands approx 2 1/4" tall. Remember before sealing wax, always lightly oil (olive or cooking oil) the stamp. looks gold due to light. 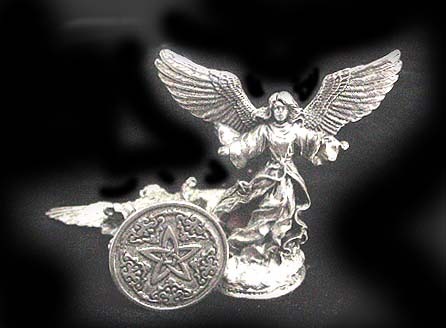 This is a 3/4" diameter, Braided Pentacle Wax Seal Stamp. Makes a stunning wax seal. 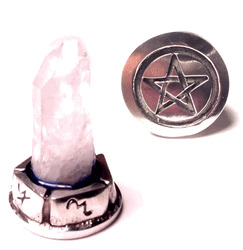 A smaller design than other pentacle seal stamps. Can be used with an ink pad and sealing wax. When using with ink place light cloth or felt under paper for the best impression. Handle is solid pewter and stands approx 3" tall. Remember before sealing wax, always lightly oil (olive or cooking oil) the stamp to prevent wax sticking. Symbol of the Egyptian Sun God, it also represents altered or higher states of awareness. 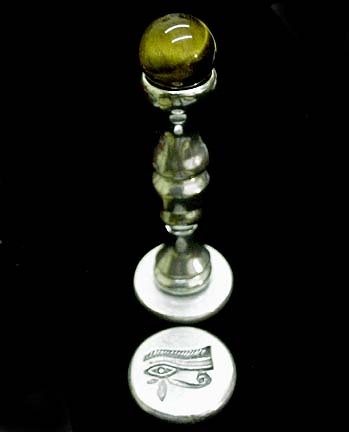 This is a solid pewter handle, 32mm diameter round Tigers Eye of Horus Wax Seal Stamp. Recommended for WAX SEALS ONLY though can be used with ink. It is a wonderful detailed impression seal which leaves a raised Egyptian Eye of Horus. This great design has both detail and depth. Handle is solid pewter and stands approx 4" tall. At the top of the stamp is a brilliant Tigers Eye crystal sphere, 1" diameter. An item to last for hundreds of years and pass on. Remember before sealing wax, always lightly oil (olive or cooking oil) the stamp. Comes bagged with instructions for 'How to seal with wax and ink'. These are approx 1/2" x 3.5" long Vermilion Seal Wax sticks. The triangle shape is much easier to melt and use than rectangle sticks. These wax seal sticks are made of premium resins, wax and color. They are made according to an ancient list of select resins including frankincense. Tree resins and wax are combined for a superior seal wax stick. Each stick will make approximately 9-12 wax seals with a 5/8" diameter. Vermilion is a rare pigment that is vivid red and sometimes with an orange tinge. Vermillion pigment provides the highest and brighest RED colour wax available and is one of the oldest pigments used by human beings today. Natural vermilion has always been extremely expensive. In the middle ages, vermilion was often as expensive as gilding. 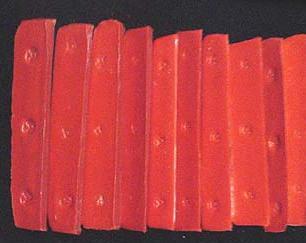 True vermilion is used to make these wax sticks. Vermilion seal wax was used long ago as early as the 12th century for sealing letters, items, relics and important documents. It was used by Queens, Emperors, Sultans and those of high rank. It is still currently used by the office Pope John Paul II and the Patriarch of Constantinople and many other churches and leaders! ** NICE IDEA ** Gold Wax Seal Accent Ink Oil available to order - dip seal in special gold ink before stamping for a gold accent to wax seals.